KateFest (a.k.a. Life As I Know It): Finally! 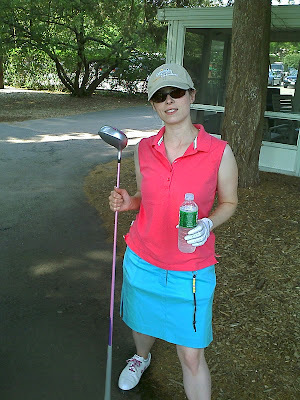 Here's me with my driver and bottle of water. 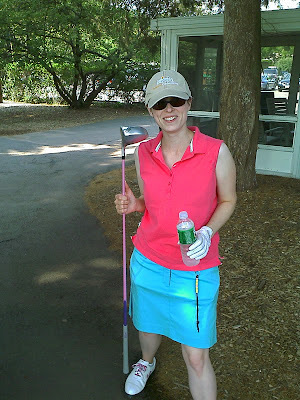 This was taken at the 10th hole and I was pretty tired. The string hanging from my belt loop is a stroke counter. Every time I hit the ball I move a little bead down to the bottom. There are only ten beads, though, so it was lucky I was only hitting 2-3 over par at each hole. My skort is a little wonky because I had balls in there. And here I am a little bit more pepped up after a drink or two of water. It took four hours to get to the 14th hole and by then I was more than a little wiped, so I said good night and joined the throng of rush hour traffickers to get home. This morning, I'm still tired. My game wasn't great because it was only my second time on a course and I was really jumped up and excited. What I needed was a freaking Valium to relax and just play the way I play at pitch and putt. I couldn't focus at all and kept coming up to see where the ball had gone before I'd even hit it. Or, I was hitting too fast and not letting the club do the work for me. I'm telling you, this game is freaking hard. You wouldn't think it by watching on tv, but I'm here to tell you that it is.